1094, Hubcap used, 15", 80, BUICK, ELECTRA, LESABRE, MACHINED FINISHED, 5-SLOT TYPE, 2 ROWS OF SLOT AROUND OUTER EDGE PAINTED BLACK WITH BLACK CENTER & FULL COLOR LOGO, 4 SETS OF SAW TOOTH CLIPS. 1423b-2, CENTER CAP USED, 85-93 FORD, MUSTANG, THUNDERBIRD. MACHINED FINISH, ENGRAVED FORD. FLAT, PUSH ON, 7" DIA. 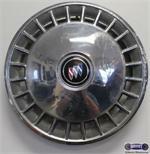 1645, CENTER CAP USED, 89-90, BUICK, ELECTRA, PARK AVE, BRUSHED FINISH, 3 DARK GREY FLAGS, PLASTIC CLIPS, 2-7/16" DIA. 1645, CENTER CAP USED, 89-90, BUICK, ELECTRA, PARK AVE, BRUSHED FINISH, 3 DARK GREY FLAGS, PLASTIC CLIPS, 2-7/16" DIA. ALSO FITS 1639 RIM FOR A 15" RIM. 1658, CENTER CAP, 16", 89-93, OLDS, EIGHTY EIGHT, TORONADO, BRUSHED FINISH, BLACK ETCHED WORD OLDSMOBILE OFF CENTER, 5 PLASTIC CLIPS, STAR WIRE, 7-7/8" DIA. 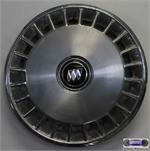 3008A-F-1, CENTER CAP USED, FRONT, 91-94, FORD, BRUSHED FINISH. OPEN CENTER 5 PLASTIC CLIPS, STAR WIRE RING. 6-3/8" DIA. 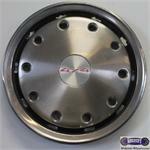 3008aF-1, CENTER CAP USED, FRONT, 91-94, FORD, EXPLORE, BRONCO 11, RANGER, BRUSHED FINISH. OPEN CENTER 5 PLASTIC CLIPS WITH STAR WIRE RING. 6-3/8" DIA. FOR A 15", RIM AF-1=STAR WIRE RING AF-2=ROUND RING. 3024r, FORD, DOG DISH, USED REAR, 92-03, FORD, BRONCO, F-150, VAN, STAINLESS STEEL CAP, WITH ENGRAVED LOGO IN CENTER, BRUSHED FINISH, RAISED WORD FORD IN CENTER, 10-3/4" DIA, 2-1/4" DEEP. 4008a, Used Rims, 15X6, 5 LUG, 115mm, 92-96, BUICK, LESABRE, ALUM BRUSHED FINISH, SMALL V ON OUBRE, ALUM BRUSHED FINISH, SMALL V ON OUTER EDGE OF RIM. 4008a, Used Rims, 15X6, 5 LUG, 115mm, 92-96, BUICK, LESABRE, ALUM BRUSHED FINISH, SMALL V ON OUTER EDGE OF RIM. 4030, CENTER CAP USED, 97-00, BUICK, REGAL. BRUSHED WITH CHROME RING & SPARKLE SILVER CENTER WITH CHROME AROUND FULL COLOR EMBLEM. 7" DIA. 4056, Used Rims, 16X6-1/2", 5 LUG, 115MM, 05-06, BUICK, ALLURE, LACROSSE, SPARKLE SILVER FULL FACE PAINTED, BRUSHED ALUM 8 SPOKE. 4515, CENTER CAP, USED, 93-96, CADILLAC, FLEETWOOD. BRUSHED FINISH, DARK GRAY CENTER & CHROME LOGO, PLASTIC CLIPS. 7-3/8" DIA. 4517, USED RIM, 15X6, 5 LUG, 115MM, 94-95, CADILLAC, DEVILLE. BRUSHED FINISH 23 ARGENT POCKETS. 4518, CENTER CAP USED, 94-95, CADILLAC, DEVILLE, MACHINED FINISH, BLACK CENTER , SAW TOOTH EDGE, CHROME LEAF & LOGO, 7-1/4" DIA.